A warning: this is probably my most controversial item since I started blogging on the Rules of Golf nearly two years ago. You will see that I have highlighted the word “only”. A very important clarification to this change to the Rules by the R&A and USGA, that became effective in January 2006, is that the device must measure distance only; it must not be capable of measuring other conditions such as wind speed or direction, the slope of the ground or the temperature. grain in the greens or for some other similar reason. Is the player in breach of Rule 14-3? A. Yes. A compass is considered to be an artificial device and must not be used for these purposes. Like many others I have spoken to, I am not sure how the use of a compass can be of much assistance to a player on the golf course, as it is obviously a matter of public information where North is and by studying a map of the course you can therefore tell in which direction you are playing, where the wind is coming from etc. However, it is clear that any device that may be used as a compass is not permitted on the course. The use of an electronic device such as a mobile phone, hand-held computer, calculator, television or radio is not of itself a breach of Rule 14-3. 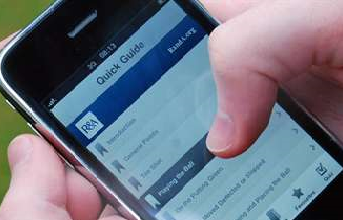 Paradoxically, the R&A have recently published, and are now promoting, their official ‘Rules App’ for the iPhone, iPad and iTouch. It allows users to quickly find information about all aspects of the laws of the game from etiquette, through a summary of the fundamental Rules, to the complete Rules of Golf (2008 – 2011). “The Rules App is a fantastic reference tool that allows you to find any Rules information you might require, on the move,” said David Rickman, The R&A’s Director of Rules and Equipment Standards. Maybe you will find it as ironic as I do that, strictly speaking, if you take this officially approved R&A app onto the golf course on an iPhone 3GS, which has an inbuilt compass, you should be disqualified from any competition. Do I approve of this situation? Definitely not! 1. If there is a Local Rule permitting the use of distance measuring devices a player may not use an iPhone 3GS for measuring distances because it has a compass feature that cannot be removed. However, it may be used for any non-golfing purpose. 2. If there is not a Local Rule permitting distance measuring devices then a player may take an iPhone 3GS onto the course, providing they do not access any feature that might assist them in their play. *Edit 2: In March 2012, the R&A further clarified the Rules regarding Distance Measuring Devices at this link. Naturally, I have to take this opportunity to plug the iPhone app that I have been involved with. ‘Golf Rules Quiz’ has been developed by remote eLearning company, Ossidian Technologies, with multiple choice questions, answers, references and explanations provided by me. Each quiz consists of 20 randomised situations experienced on the golf course, selected dynamically from a repository of several hundred. The questions are in a multiple choice format offering four alternate answers. Your challenge is to pick the correct one. An explanation of the correct ruling is delivered after each question has been answered, ensuring that the user will absorb and obtain a better understanding of the Rules of Golf while entertaining themselves testing their knowledge. As players advance within each quiz they can keep track of their scores. They can then see how they perform over a period of time, as they repeatedly assess their improving knowledge over a number of different quizzes and compare their results with their friends. 'Golf Rules Quiz' will definitely help you to understand and absorb the Rules of Golf in a most enjoyable and entertaining way, and at just €3.99 ($4.99) is a must for anyone who enjoys golf and who has access to an iPhone, or similar. It can be purchased direct from the iTunes store (search for ‘Golf Rules Quiz’) or at http://www.apptism.com/apps/golf-rules-quiz. We have a mini-tour in the US that allows players to use laser range finders (without elevation adjustment). They had an improvement of almost 20 minutes a round because of them. Maybe someday this technology will be accepted. Are you in favor of it for tournament golf ? No, there is no Rule of Golf that prohibits the use of mobile phones on the course. However, many Committees introduce a condition of competition banning their use. My own Club has introduced a Local Rule permitting the use of distance measuring devices but I remain unconvinced and would rather not see them permitted for professionals' tour events. Very interesting and relevant Barry. My own opinon, having played with a couple of golfers who used iPhones during the round, is that they have the potential to serously slow down a round of golf! There were two main problems I noticed (not to do with the rules of Golf), 1. They tried to read the iPhone screen, but couldn't due to the strong sunlight and 2. If they left the iPhone powered on for the whole (4 hour) round, the battery would run out, so one guy was powering off and on the iPhone each time he used it, which added even more time to get his distance! Also in both cases, neither golfer was of sufficient technical ability to strike their irons a consistant distance, so knowing exactly how far it was to a particular location was irrelevant. I also asked both golfers if they knew their yardage with each club and both confessed that they didn't! To confuse the issue even more, reading the text of the rule discussion below, there also seems to be an issue of linguistic symantics. For example, where it says, "..it must not be capable of measuring other conditions such as wind speed or direction, the slope of the ground or the temperature..." Personally, I would understand "..wind speed or direction..." as it is written, to mean wind speed or wind direction. If it was intended to mean geographical (and not wind) direction (i.e. N,S,E,W) I would have written it as as "...wind speed, direction, the slope of the ground...." If an artifical device was not permitted to measure wind direction, could I not look at the Weather Vane on the top of our club house ;-) Anyway, I'm not a linguistic expert, but as you know the rules of golf are written in very precise language - as you rightly demonstrate by pointing out the word only at the end of the sentence in the note to Rule 14-3. The bottom line for me is - if a distance measuring device speeds up play then I'm for it, if not, I'd rather not play with someone who uses one. 90% of golfers I play with are not consistant enough ball strikers to benefit from knowing precise details of yardages. Take the money you might spend on distance measuring devices and spend it on a few lessons with your local Pro instead. Thanks for your interesting comments on this subject. I understand the point you are making about the semantics of "wind speed or direction" but nevertheless refer you back to Decision 14-3/4 which prohibits the use of any compass device because it could assist a player "in determining wind direction or the direction of the grain in the greens or for some other similar reason". It seems that a weather vane on the clubhouse is OK, providing that a player does not bring it onto the course! Cell phones could be useful for calling a rules official when one is needed. In most of the tournaments I help with in the Midwest US, there are not enough rules officials to cover the course. If they could be conveniently positioned on the course, they could be summoned when needed with a phone. I was at a PGA Junior event 2 years ago and they encouraged golfers to use their phone if an official was needed. Silly, all phones continue have similar features and more will be out on the market each month. The R&A and USGA will soon be the new "Consumer Reports" of electronics! Either no phones or just forget about it. I agree. With evolving technologies the Ruling Bodies will have to revisit this subject to avoid confusion amongst players and officials. If a compass is a problem, I would think that having a watch would also be a problem since, as we were taught in the service, a timepiece is a very handy alternative direction finding device. Ssssshhhhhhh! Don't let the R&A / USGA know! Interesting article. I use my iphone with a app called golfshot when I play. This gives you an aerial shot of each hole (much the same as a course planner although these tend to be fairly inaccurate). It also gives you the distance to the front, centre and back of the green. It does not tell you what club to use, I make that decision myself. It definately saves time on a round as instead of looking at a planner, then trying to guess where you are, you get a distance in 2 secs. This is no different from having a caddy walk the course and have a notebook on each hole. And, as I play many different courses saves me much time, not to mention shots as I am more confident I have the correct club in my hand. Unfortunately, even if your Club has introduced a Local Rule permitting the use of distance measuring devices, using Golfshot on your iPhone renders you liable for disqualification from competitions that are run according to the Rules of Golf of the R&A/USGA. This is obviously an unsatisfactory situation and I expect it to be clarified at the end of this year, when the next revisions to Rules and Decisions are announced. Hi Barry, thanks for your reply. It does seem a bit silly that I could use a hand held device but because the iPhone has a compass it is illegal. You can be trusted not to move your ball or any number of other ways of cheating but not be trusted to check wind direction etc. fortunately I don't play in any compo's. The specifics relating to measuring temperature, wind speed, and/or gradient are the key issues determining whether a device is non-conforming. In their Q&A the R&A specifically align compass with anemoter where the latter feature does measure wind-speed and temperature. It is worth noting that the utility on the IPhone does nothing of the sort and as such should not be considered non-conforming when taken everything into account! In fact the compass function in the utilities area of the phone is all the more confusing when you compare portrait with landscape [and then invert both] because they are all different readings which CANNOT assist with club selection. This clarification should be challenged on that basis. The rule itself should be more specific (precise) in that a "compass with additional anemoter features etc.."
You say "...should not be considered non-conforming when taken everything into account!" I agree, but the way things stand it is clear that an iPhone may not be used in competition for measuring distances, even if there is a Local Rule permitting the use of distance measuring devices, because of its inbuilt compass feature. I am confident that the R&A / USGA will resolve this anomaly when they announce the 4-yearly revisions to the Rules at the end of this year. Barry, could you please explain the reasoning behind banning distance measuring devices. I have just assissted at the Canadian Women's amateur championship, as with most courses around here there are markers for 200, 150 and 100 yards from the centre of the green. Competitors simply pace off the distance from their ball to the nearest marker. They are also issued plans of each green, giving the measurements of the pin placement, so they obviously, gratis the organisers, know the almost exact distance of any approach shot. What is the difference that the authorities seem to find between this and using a range finder or electronic device? I have to emphasise that there is no outright ban on the use of distance measuring devices, but they may only be used where Committees have introduced the Local Rule that permits their usage. This is an individual decision to be made by Clubs and courses around the world depending on the local factors. There are many 'traditionalists' that do not want anything technological to change the way that they think that golf should be played, there are others that argue that these devices are elitist in that they are not cheap and cannot be easily purchased by everyone, others claim that they interrupt the flow of the game, and so on. I am sitting on the fence in this debate; but I will say that I have not yet joined the ranks of distance measuring device users. An IPad does not have a built in compass in the hardware like the Iphone so is it legal? Yes, providing the iPad does not contain any applications or features (golf related or otherwise) capable of measuring conditions or providing information (e.g. current local weather conditions, temperature, wind, slope or club recommendation). So really use of all smart phones would render disqualification since they all have features that measure the current temperature. No, I don't think so. To my knowledge, smart phones do not measure temperature, they report on likely temperatures in broad areas. Virtually all Smart Phones contain an accelerometer. This is used to determine the phone's orientation and rotate the screen when it's being held in landscape mode for example. The accelerometer is pretty accurate and can determine the phone's level to a degree or better (as can be seen by the spirit level applications you can download). Therefore it can be used to gauge slope. You cannot disable the accelerometer on any phone as far as I know, so all smart phones are non conforming, not just the iPhone. Unfortunately, this is a complete can of worms and needs to be sorted out properly. Otherwise we will see a blind eye being turned to this rule. If we get that, people will begin to think that it's OK to turn a blind eye to any other rule of golf too. My understanding is that whilst smart phones do have an accelerometer, as you explain, they cannot be used to measure slope without an associated application. Therefore, it is my understanding that they do not breach the guidelines set out by the R&A and USGA, providing no such application has been downloaded. The compass on iPhones is different as it is inbuilt to the device and does not require any additional application. My phone can give the slope via a 'spirit level' app, but not only would i look like a complete idiot if i used it to measure the slope on a green, it would also be obvious to any of my playing partners. My metoffice app can show up to the minute radar of the area i am in but i don't use it for the same reason i don't kick my ball into a better position in the trees. Because I am honest... Is there an app for that? I hope that I have clarified that if a golfer accesses any app on their smart phone during their round, which could assist their play, they incur a penalty. However, I think that you need to be careful when using your analogy of why you don't kick your ball into a better position in the trees. There are many things that may assist a golfer play their round, which are permitted by the Rules, e.g. use of a stroke saver, applying a drying agent to their hands to improve their grip, throwing grass in the air to test the wind direction and using a dedicated distance measuring device. Part of what I try to do is to help golfers to understand what is permitted by the Rules and what is not. Thanks for your quick reply RE the accelerometer. You make a good point about the fact that you have to download an App to use it. However, playing devil's advocate, I believe I can make a case that I can gauge slope without downloading anything. If my phone is in landscape mode and I put it on a flat surface, it will stay in landscape mode. However, if the slope is greater than a certain consistent amount, the display will rotate. This is the case for all smart phones. I'm not suggesting for one minute that anyone would actually do this, but the rule is flawed. I think the R&A and USGA have got themselves into a bit of a mess here and need to sort it out. Thanks for your interesting blog and very useful book by the way. It seems that the accelerometer on your smart phone works a lot more efficiently than mine! "If, during a stipulated round, a player uses a distance-measuring device that is designed to gauge or measure other conditions that might affect his play (e.g., gradient, wind speed, temperature, etc. ), the player is in breach of Rule 14-3, for which the penalty is disqualification, regardless of whether any such additional function is actually used". It's the "regardless of whether any such additional function is actually used" that causes all the issues. This does not seem to make sense to the proverbial “reasonable person” and seems to contradict the spirit of other rules. Even if I have 15 clubs in my bag, I can nominate one as “Out of play” and avoid disqualification. I can carry alignment sticks in my bag without penalty, as long as I do not use them during a stipulated round. What's so special about an iPhone compass that the owner may even be unaware of? This is an interesting debate as we are introducing this local rule at our club at the moment. I'm loathed not to use the Specimen Wording, but unfortunately I see it as unmanageable. Quite a number of people with iPhones who have paid good money for GPS golf applications would rightly be "slightly miffed"! Your point is well made and I do not disagree. However, I do see a difference between something that is obvious to a fellow competitor or opponent (e.g. using the extra club or alignment sticks) and a device showing information that can only be viewed by the player. Once again, I agree with you that it is relevant how obvious something is. However,anyone carrying a smartphone could be surreptitiously obtaining information illegally on the internet and no-one would notice any more than if they were checking the compass. Exchanging texts with a coach would probably be more beneficial. The rules of golf are based so much on trust. I don't see the potential benefit to the golfer in this case is worth taking away that trust. Thanks again for this interesting debate. My blog dated 14th January 2014 contains the updated information on the use of smart phones as distance measuring devices, including a very useful link to the R&A statement, 'Your Distance Measuring Device Questions Answered', which I recommend you check out.